Join Commercial Loan Corporation on October 10th, 2018 at the upcoming Orange County Bar Association event. 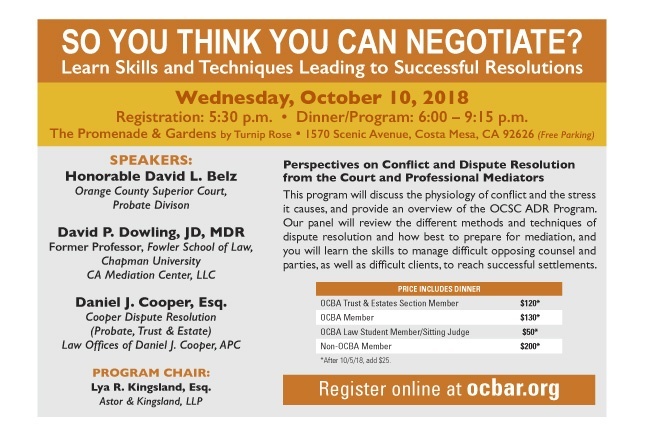 The Orange County Bar Association Trust & Estates Section Presents “SO YOU THINK YOU CAN NEGOTIATE? Learn Skills and Techniques Leading to Successful Resolutions” at 5:30PM on 10/10/2018 in Costa Mesa, CA. 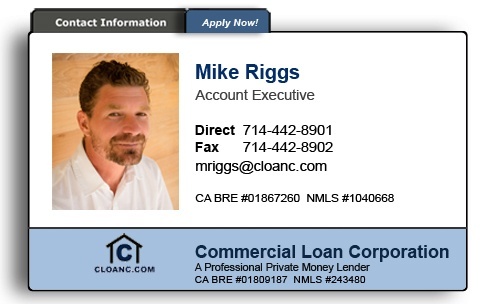 Mike Riggs, Senior Account Executive at Commercial Loan Corporation will be on hand to answer any questions you have on our Trust & Estate Loans. 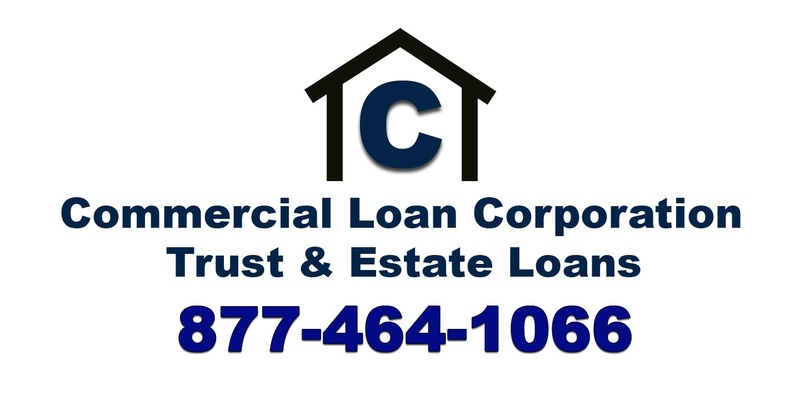 Commercial Loan Corp specializes in lending to Family Trusts and Estates in Probate. If you are unable to make the event, please call us at 877-464-1066. Our team can review a loan scenario with you or a client to see if they might benefit from one of our Trust & Estate loan programs. Often times, our trust and estate financing is used to equalize a trust or estate distribution to take advantage of Proposition 58 and avoiding property tax reassessment on a home that was inherited from a parent. Our specialized Trust & Estate finance programs can help a client distribute their trust faster, provide cash for legal fees and save money! Our Trust Loans are typically less expensive than selling a home. That means more money for the beneficiaries and we can fund a Trust or Estate Loan in as little as 7 days! On average we save our clients over $6,000 a year in property tax payments by avoiding property tax assessment on an inherited property. 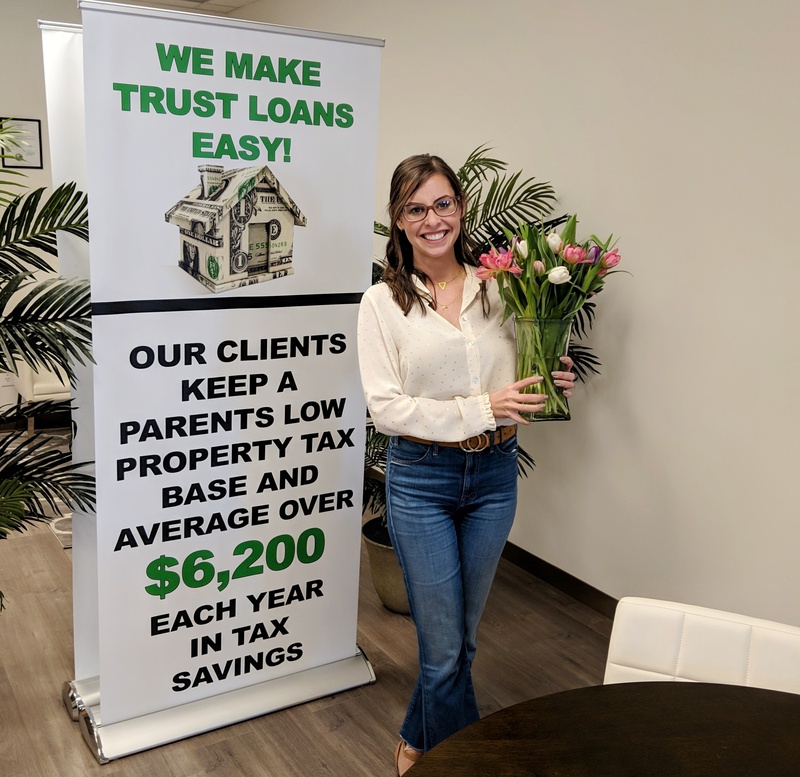 If you are looking for a loan to a Irrevocable Trust, Family Trust or Estate, please call us at 877-464-1066 for additional details or a free benefit analysis. Commercial Loan Corporation & Michael Wyatt Present Property Tax Issues In Trust And Estate Distributions – Call 877-464-1066 for additional information. 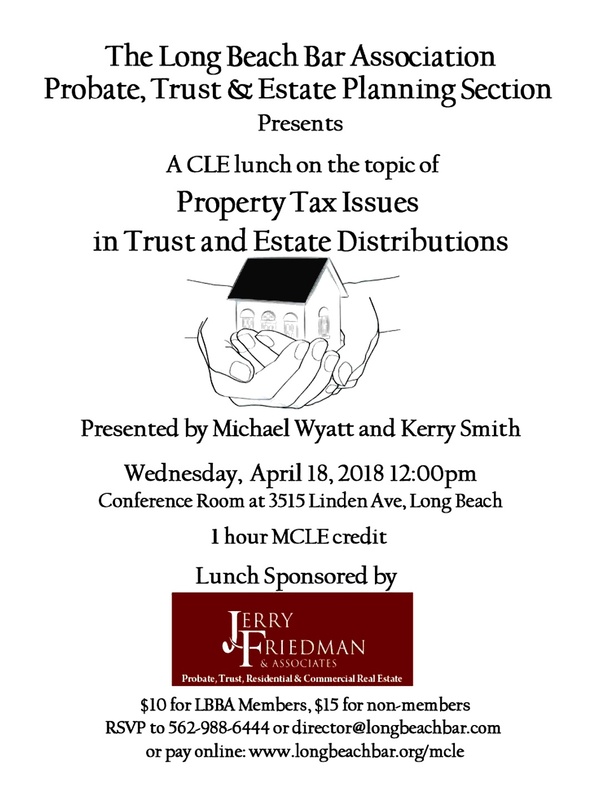 On Wednesday, April 18, 2018 at 12:00 PM, Commercial Loan Corporation & Property Tax Specialist Michael Wyatt will be presenting Property Tax Issues In Trust And Estate Distributions For The Long Beach Bar Association, Probate Trust and Estate Planning Section. Along with Michael Wyatt, Kerry Smith the President of Commercial Loan Corporation will be discussing common issues to consider when dealing with property taxes, California Proposition 13 and California Proposition 58. 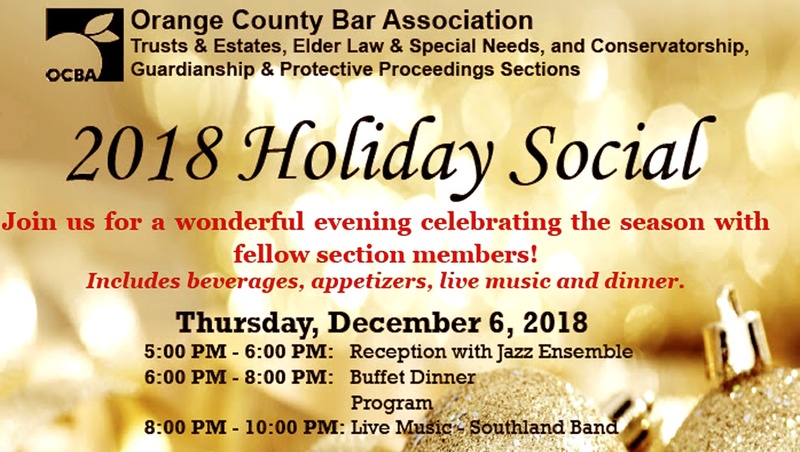 The cost to attend is $10 of Long Beach Bar Association members and we encourage you to RSVP as soon as possible as seating is limited for this event. If you have questions regarding a 3rd Party Loan to a Trust or Estate, please call Commercial Loan Corporation at 877-464-1066. Commercial Loan Corporation is a Professional Private Money Lender. 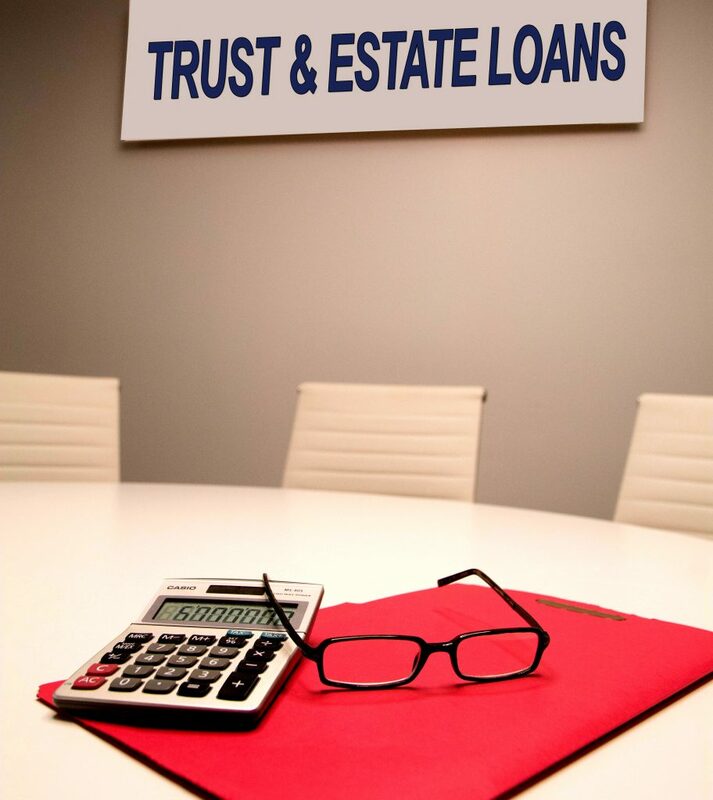 We can assist you in making sure that you or your clients Trust or Estate loan transaction is a successful one. 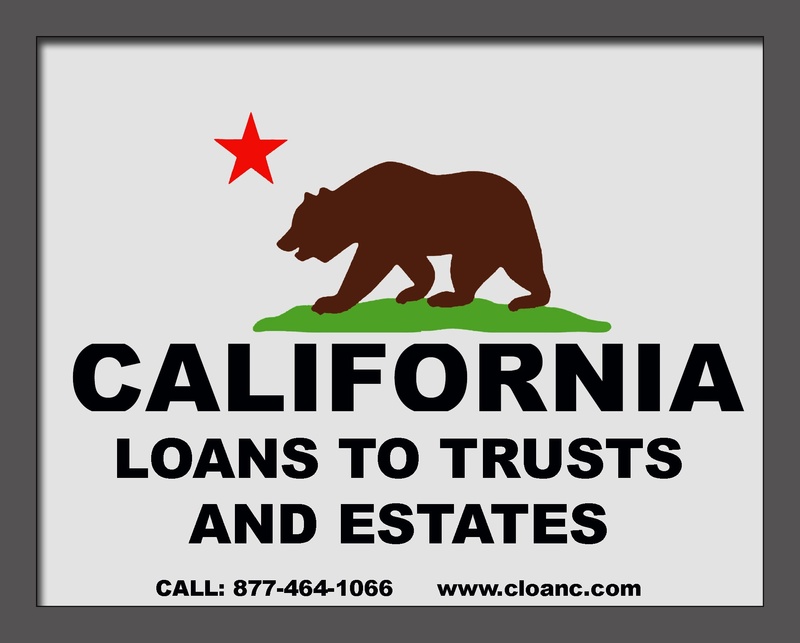 We specialize in providing mortgages to trust and estates so that an even distribution can be made and a beneficiary or heir can take advantage of California Proposition 58 and receive an exclusion for property tax reassessment. Doing so allows a child to retain a parents low Proposition 13 tax rate on a transferred property. The Property Tax Issues In Trust and Estate Distributions seminar fulfills 1 Hour of MCLE credit.